This pocket-sized emergency communication chart has FOUR different languages represented. 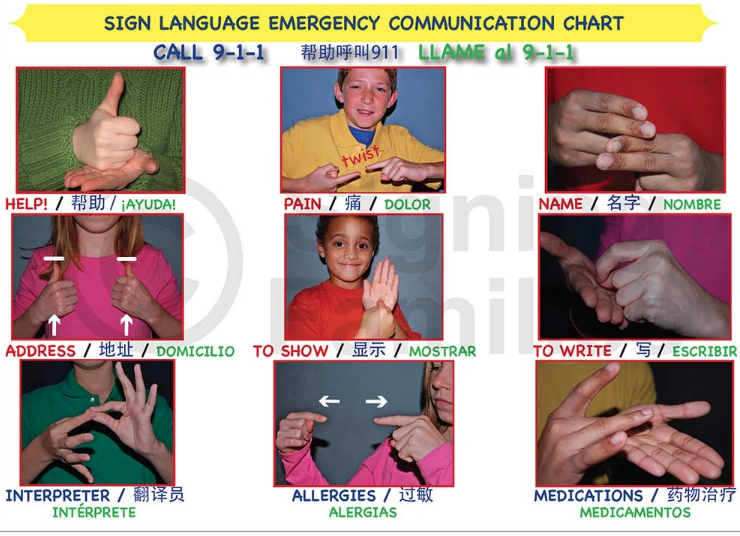 Photos for a dozen important informational signs are in sign language, English, Spanish and Chinese! There is a space for writing with a washable marker allows for efficient communication during challenging situations, such as medical emergencies or disasters. Also, numbers, common symbols (such as for email) and the alphabet is included. This card has a special coating for easy cleaning. This emergency mini – chart has been used by thousands of First Responders and Community Emergency Responder Teams (CERT). Also, valuable for those who work in schools, are involved with service related industries (such as bus drivers, flight attendants, etc.). Restauranteurs and hospitality workers are also using this chart to help customers who are in need of assistance. We offer this chart for those who reside in the United States. Price includes shipping within the USA. Don't want to order via PayPal or don't see a button to order? EMAIL US at the LINK BELOW! Bulk orders needed? EMAIL US! Shipping included, but note: we only ship within the United States. For outside the USA orders – please send an email. Thank you. NEED TO CONTACT LOUISE AS SIGNING FAMILIES ABOUT EMERGENCY PRODUCTS?